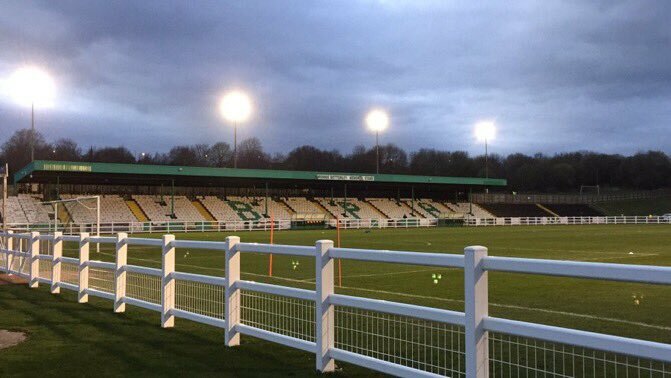 Alfreton Town head to Yorkshire to face play-off sitting Bradford (Park Avenue) looking to extend our unbeaten run to six games in the National League North, kick off at the Horsfall Stadium is 3pm. After a deserved draw at Spennymoor last weekend saw our winning run ended, the Reds will be full of confidence heading to another top seven side. Alfreton struggled to adapt to the surface last weekend and soaked up Spennymoor pressure throughout the first half in front of a crowd of 1083. Jordan Sinnott had our best effort of the half when his free kick from 25 yards smashed off the bar and bounced out, Richard Peniket looked certain to score but could only head straight at the goalkeeper who swiped the header away. Glen Taylor then gave the hosts the lead with a sharp turn into space and low finish into the bottom corner with Sam Ramsbottom getting a touch. It was a welcome lead for the Moors with the Reds frustrated that the golden chance hadn't been taken and also the surface proving a challenge. The second half proved outstanding from Alfreton who dominated the then third placed sitting Spennymoor; Sinnott and Declan Bacon had big chances both saw their efforts go wide and saved. Then Tom Platt was brought down in the box after a weaving run and this time Sinnott planted the penalty down the middle to bring a deserved equaliser for the Reds. Further chances came for us when Danny Clarke headed over at the far post but we couldn't capitalise on many chances created and left Brewery Field disappointed that we didn't grab the three points. Alfreton will be full of confidence heading to Bradford tomorrow and with a solid unbeaten run behind us, another test against one of the divisions promotion challenging sides is bound to bring the best out of the Reds once again. We head into tomorrow's fixture on a five match unbeaten run in the league, with four of these being wins. We sit third in the form table with 13 points obtained in our last five (only Brackley and Chorley are above us). The Reds have tasted defeat just once in the last five away trips and have won three of the last five away games, we will be looking to hit the back of the net tomorrow for the 19th consecutive away league game. Hosts Bradford PA sit in fifth place in the league table with 61 points from 36 games. Their current playing record stands at: P36, W17, D10, L9. Avenue suffered a set back in their promotion push with a mid-week defeat on Tuesday to fellow play-off side Telford United (1-2), this defeat ended Bradford's seven game unbeaten run and was also Bradford's first defeat at home in their last five outings. The hosts will be looking to bounce back from that defeat and return to winning ways for the first time since winning at Spennymoor ten days ago and in turn continue their push for third spot. Horsfall Stadium, Cemetery Road, Bradford, West Yorkshire, BD6 2NG. Adults £12, Concession £9, Students £7, Under-16s £2. Alfreton Town 0-1 Bradford PA (Saturday 29th September 2018): A powerful header by Conor Branson from a Nicky Wroe corner with 71 minutes elapsed sealed the points for Avenue and handed the Reds a third straight defeat in the league back in September.